Soap Aloe, is a perennial succulent plant known for it's attractive thick, fleshy foliage and it's use as a natural soap! Soap Aloe blooms red and orange flowers in the warm months of the year and is very attractive to hummingbirds and insect pollinators. Soap Aloe is fast growing and spreads through new plants at it's base, called pups, making it an excellent ornamental and useful groundcover. It is known botanically as either Aloe maculata or Aloe saponaria ﻿is a unique aloe variety native to South Africa. Another name for Soap Aloe is Zebra Aloe, after it's green striped skin. Sharp, hot pink spines line the edges of each leaf. Plant soap aloe in full sun or partial shade in a well-drained soil. Once established, it will be highly drought tolerant. Soap Aloe pairs great with another, more fragrant, natural soap substitute; Hawaiian Awapui Ginger. Harvest Season: Blooms intermittently throughout the year, harvest year-round. 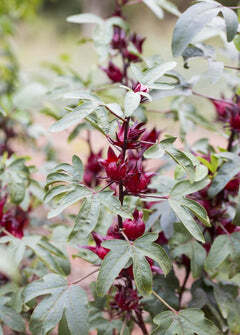 Mature Size: Foliage grows to about 1-2 ft tall and wide but the bloom spikes will reach up to 4 ft. Soil & Moisture: Loose, sandy or rocky, fast-draining soils; indoor plants are best in a cactus soil mix. Water regularly in first growing season to establish root system; drought tolerant once established.